The latest direct-drive SG 10.0-193 DD represents Mark V of product evolution within SGRE’s technology roadmap. The era officially started with the commercial launch of the 6MW SWT-6.0-154 in 2014, though this had been preceded in 2011 with a prototype featuring a 120-metre rotor, and the following year with the installation of a second prototype with the production 154-metre rotor. Commercial ramp-up of blades and nacelles for the Mark IV iteration — the SG 8.0-167 DD — starts this summer with the first commercial installations due in 2020. This model features 81.5-metre B81 blades. The SG 10.0-193 DD is visually characterised by a shorter, box-type nacelle, which is easier to manufacture and transport, and together with the larger-diameter generator represents another prominent new feature. The leading principle behind the product development is to further reduce capex during serial production — in response to the continued downward pressure on prices prompted by recent auctions, with some zero-subsidy offshore projects now being planned. Another objective is to maintain the rate of installing a complete turbine in one day. SGRE was keen to create an optimal set-up for reutilising its existing mature supply chain, and its own blade and nacelle factories. "To start manufacturing ramp-up in 2022 was a primary project driver because it allows two years’ testing and validation for all main components and at systems levels," says project manager Anders Sylvester Bjerg. "However, such a tight time to market sets constraints on achievable technology choice and innovation levels," adds chief engineer Rasmus Holm. Interlinked questions they asked themselves were: what can we best do with the hardware and infrastructure already available? And, what might be the best-suited compromise solutions for their customers’ base? One of many key decisions to make was a specific consideration on the maximum width for the new blade, so the same number of moulds could still fit into existing manufacturing halls, representing a big cost saving. Taking all time-related and other constraints into consideration, the development team chose to retain the turbine technology architecture introduced with the SWT-6.0-154, with the exception of the new 94-metre B94 blade. This slender structure incorporates carbon and allows leaner production compared with the glass-fibre-based B81 blades. "We also decided to retain low-voltage for the generator because we had gained a lot of experience with it and there is a large mature global supply chain for the power-electronic components," says Bjerg. "The outer-rotor PMSG again has 12 stator segments, but they are bigger than the elements in the 6.4-metre generator deployed up to the SG 8.0-167 DD," he says. "Other conceptually similar but enhanced main components are the double-row taper-roller rotor bearing, main carrier, two converters and 66kV [standard] transformer sizes," says Holm. "Choosing an alternative rotor bearing solution would have taken much longer to implement and would require complete new testing and validation, plus building experience." A major limitation was that an external supplier of the enlarged hub casting experienced "bare component" deformation caused by own mass, which seriously complicated machining operations. Optimising the design requires minimising wall thicknesses, while maximum stiffness and strength characteristics are achieved only after the final mounting of stiffener plates and bearings. As Bjerg and Holm explain, the SG 10.0-193 DD has a four-point contact ball-bearing type pitch bearing, but in combination with load-based pitch control. These specific choices necessitate slightly bigger bearing and hub dimensions compared to a smaller-size three-row cylindrical roller bearing alternative, as a consequence. Turbine assembly and service activities, such as reaching overhead bearing and hub mounting bolts, are made more challenging by the increased size of the main components. And because the stationary hollow generator shaft is bigger, steps were added to get from the shaft over the main bearing into the hub. A stationary working platform inside the hub has also been added. Another modification to facilitate servicing is a telescopic hydraulic crane mounted at the main carrier top section. This can be used internally to handle partial or full components, and for parts exchange with fully extended beam through a hatch in the nacelle rear. "We have a strong tradition in testing and validating all products we make," says Peter Fuglsang, SGRE’s head of technology for blade development, based in Aalborg. "Furthermore, we conduct more tests as standard than is required for certification, with a focus of continuous learning. "Advanced models thereby form the scientific basis for developing test procedures, but validations relies on reliable data inputs." In-house testing allows building fresh know-how and experience first-hand, and it enables calibrating and continuously refining the models used, Fuglsang adds. As an example, the maximum loads a single B94 blade must carry at IEC I North Sea sites with 10m/s wind speeds, means that 360 tonnes of air pass the rotor plane every second. Corresponding blade loads are comparable to mounting a family car on a stick 3.2km in length. Very large slender structures hold considerable instability risk, points out Fuglsang. This is especially due to blades twisting and bending under load and in having to avoid critical natural or eigenfrequency operating models. The B94 blade represents the single largest innovation step in the overall development of the 10.0-193 turbine. "It re-uses the proven IntegralBlade technology also deployed on the B75 and B81 blades, whereby full blades with single web reinforcement are manufactured in a single-mould process," says Fuglsang. "Our experience with IntegralBlade technology date back to 1999 with the first 30-metre B30 prototype blade. "For the B94 blade, we switched to integrating carbon in the load-carrying structure. The fact that traditional erosion-prone leading-edge and structurally critical trailing edge seams are eliminated remains a big benefit of the system," he says. 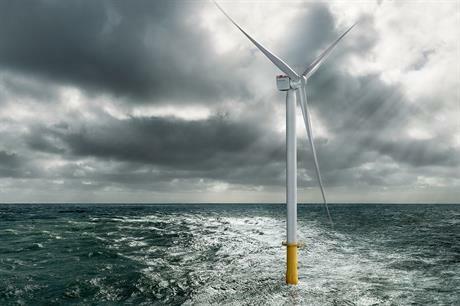 Fuglsang adds that more than 2,000 75-metre B75 blades, fitted on the 6MW and 7MW offshore turbines, have so far been built in Aalborg and Hull in the UK. SGRE is the only supplier that has made such large blades in these large volumes. Integrating carbon allows slender but stiff structures with less deflection under load, and a significant mass reduction compared with glass-fibre units. "The SG 10.0-193 DD blade mass also scales well with the competition’s latest and largest blades. Cost-effective carbon application in rotor blades has matured a lot, compared with the previous supplier focus on aerospace technology, where cost is only secondary," says Fuglsang. "But incorporating carbon requires additional effort in reliable and effective lightning-protection solutions, and overall inspection measures to ensure carbon fibres in the laminate are always aligned." Bjerg and Holm argue that the current SG 10.0-193 DD configuration with a 342W/m2 specific power ratings fits well into current client demands for high-wind North Sea applications. A future potential rating increase with unchanged rotor size would fit into SGRE’s product scaling strategy, but might not necessarily be repeated here, they say. Though some of SGRE’s main clients communicated that a modest rating upgrade could fit well into future liberalised electricity market business cases with high electricity prices during conditions with little wind and high power demand.